This two bedroom apartment is on of our holiday lettings in Los Cristianos Tenerife. 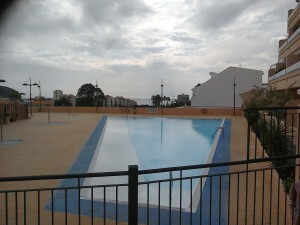 It is a self catering apartment on the residential complex, Los Ceres. We booked our holiday through Karen Durant from Holidays 4U. The apartment was in Los Cristianos, Tenerife. The lady who met us with the keys was very friendly and showed us around the apartment, including how the wifi worked and the English TV. We found the apartment to be very well located as it was close to restaurants and bars as well as being an easy walk from the beach. The apartment was very well equipped and clean on our arrival. There were even some books and games, which was a nice touch. It is a quiet complex, but that suited us quite well, as we like peaceful surroundings. The weather was really good as well, which was the icing on the cake. We stayed in the Los Cristianos resort in Tenerife. Would highly recommend this resort as it is very family friendly and is a fair distance away from the Las Veronicas area where all the night clubs can be found. Our apartment was close to the beach and also close to some nice restaurants and bars. Can recommend the Chinese restaurant Fu Lin, which is situated in a back street close to the port. They serve lovely Peking Duck with the most amazingly fine pancakes. You can sit on the balcony which overlooks the beach and sea. There are some good sports on the beach as well including trampolining and volley ball.